The story of La Gazza Ladra turns on a series of crazy coincidences and a handful of situations that are supposed to be realistic. Too much, right? But audiences at the time loved improbable events conspiring to produce intense situations. For this kind of drama, coincidences are a feature, not a bug. Popular novels of similar vintage are even fuller of them - including many still respected and even beloved today. If you make a chart of the chance encounters that shape David Copperfield or Middlemarch, it will look maze-like and - in the absence of the prose - pretty ridiculous. That death sentences could be imposed for such things as going AWOL from the army or stealing some silverware. All too real; life was cheap, especially the lives of commoners. England’s “Bloody Code” at the start of the 19th century had about 220 crimes punishable by execution, among them “grand larceny,” which was defined as anything worth more than twelve pence, at the time about 5% of a skilled worker’s weekly pay. That a small-town mayor might propose commutation of a sentence in exchange for sexual favors. No problem with believing that one in our Me-Too era; it’s still going on. That magpies are drawn to shiny objects and inclined to carry them off, thus exposing innocent serving-maids to the gallows and whole villages to convulsions of scandal and grief. This one is a little problematic. European folklore - not just in this opera and the popular play on which it was based - has long held that the common magpie (pica pica) carries bright trinkets to its nest. An Exeter University study in 2014 concluded that this is myth; in 64 trials with items like screws and bits of tin foil placed near clumps of nuts, only two birds took the bait, and both discarded the inedible objects immediately. Some of them even reduced their nut consumption because the alien objects apparently made them nervous. On the other hand, the study may have been imperfect (it seems that “married” magpies like regularity in their feeding habits, and it’s possible that singletons forage more variously). And there are undeniable photographs that at least seem to show the traditional behavior - though none with anything nearly as big as a table fork. So in this case we may have to suspend disbelief in order to take Rossini’s opera half-seriously. Please note, however, that according to Ballou’s Monthly Magazine (Boston, August 1875), a servant girl at a country manor near Lambeth was “taken into custody, on suspicion of stealing” a spoon and a pair of sugar-tongs, only to be released when they were found (along with a milk-pot!!) in a bird’s nest in the garden. The culpable party in this case was a raven (corvus corax), but I think we can accept a bit of poetic license, and need not retitle the opera Il Corvo Ladro. To understand this week’s record, you first have to imagine the piece the way any normal 21st-century musician would read it. The work in question is the scherzo from a string quartet by Luigi Cherubini (1760-1842), composer of Medée and thirty-something other operas, author of one of the many informative “how-to-sing” books that proliferated in his lifetime. Here’s a score to follow if desired, and here’s the opening as performed by the first-rate Quartetto Savinio in 2008. The first obvious contrast is speed (slower!) and pacing (flexible!). First mental question: Scherzo generally means a very fast piece in ¾ time, but did it always? Second: what’s a tempo anyway? The Klingler players do the beginning at about mm=72 (but slower on the first beat), while by bar nine they are up to mm=108, and both those extremes will be visited again. Beyond this, there are differences of detail in practically every bar. It doesn’t take long to sense something else arching over the measurable contrasts: the Klingler players seem to be portraying something, like actors in a scene. Those open fifths in the cello part - maybe a folk-instrument with a drone pipe? The wayward melodic line - maybe what someone might have called “gypsy” fiddling? We’re not asking whether Cherubini had this in mind - maybe he did, maybe not. The question is what Karl Klingler, Richard Heber, Fridolin Klingler, and Ernst Silberstein had in mind. One way or another, it seems clear that they are working from special information of some kind. Not just from the score. In the final wisp of melody, why are some eighth-notes so much longer than others, and why is the first violin so far out of sync with the others? It’s also possible that they were simply passing along an interpretation that had inspired them. The piece had been in the repertory of the Joachim Quartet, one of Europe’s most celebrated ensembles from 1869 to 1907, and the Klingler Quartet was founded in 1905 with the explicit mission of carrying on the older group’s traditions. Joachim (1831-1908) was the most important violinist in the German-speaking world for some sixty years (more about him in another post), and both Karl Klingler and Richard Heber had been his students. So had the group’s previous second violinist, Josef Ryvkind. Fridolin Klingler, Karl’s younger brother, was the violist throughout the quartet’s thirty-year existence and may have studied with Joachim too. The original cellist, Arthur Williams, had actually subbed for years in Joachim’s own quartet when its permanent cellist, his teacher Robert Hausmann, was engaged elsewhere. Hausmann himself was engaged as a coach to help the new group replicate the sound and style of their celebrated predecessors. The Klinglers made records as early as 1911, but nobody really thought yet in terms of preservation through recording - the way to preserve a tradition was to emulate it in live performance. The Klingler Quartet disbanded twice, first in 1914 because Williams was suddenly an enemy alien; again in 1936 because the new cellist (Silberstein, the one heard in Cherubini) was a Jew. The Klinglers preferred to dissolve the quartet at the height of its fame rather than bow to the demand for an all-Aryan roster. At the same time Karl was forced into early retirement from the Berlin Hochschule professorship he had inherited directly from Joachim, for protesting the removal of Jewish musicians’ portraits. (One of his pupils from the 1920s went on to have a profound impact on the violin world: Shinichi Suzuki. Sometimes we think of it as positive to search for our interpretations in the score and only the score - but that is never really the whole story, and the closer we come to trying to make it the whole story, the more we are bound to the blunt arithmetic of our notational system, which can represent only defined fractions of defined units of time. Everything lying “in the cracks” between those defined fractions has to come from “musicality” - in other words, from whatever we have absorbed from the way we’ve heard others play. Consciously or not. And composers knew this; after all, they were performers too. Sometimes we need to liberate ourselves from traditions we might be following unthinkingly - but if we reject tradition altogether we are rejecting a big part of music itself. So relics like the Klinglers’ are precious links to information we have little other way to access. Heinrich Schlusnus was a late starter for those days - already 27 by the time he made his debut in 1915 at the Herald in Lohengrin in Hamburg - but he was ready, and by 1917 he was at the Berlin State Opera as Wolfram in Tannhäuser, with Rigoletto, the Count di Luna, Germont, and Renato in Ballo under his belt in the meantime. He was still singing Germont and Rigoletto onstage almost up to his death in 1952. In between he made so many records (516 commercial ones, according to German Wikipedia, plus uncounted broadcasts in his later years) that it’s easy to forget about the first ones, still made in the pre-microphone era. This is one from his second session, the big aria from Il trovatore recorded just a year after his Berlin debut. One of the most interesting things about studying the history of singing is finding out which present-day assumptions were age-old truths and which ones weren’t. In the second category comes the idea that singers should start in lighter roles and progress to heavier ones. That almost never happened a century ago; most singers found their repertory early and stayed in it for life, as Schlusnus did. I’m glad they didn’t tell him to “wait” for the great Verdi roles, because this is about as good as it gets in Trovatore. And is Verdi dangerous for a young voice? Not if the technique is right. Schlusnus channels his strong, focused sound into perfect legato and never pushes it in the Verdi aria, and his voice never lost the clean definition, pristine surface, and easy vault into the top range heard here. Proof of method? One of Mahler’s Wayfarer songs recorded 33 years later. Teatro Nuovo puts great emphasis on learning from the singers who had never heard, or heard of, microphone singing - primitive recordings from more than a century ago, forming a link to the traditions of opera’s heyday and the infinite potential of the natural, unassisted human voice. Check this space regularly for samples! 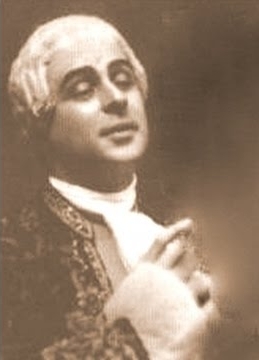 There is no such thing as perfection in singing, and no limit on how much better something might conceivably be, so let's start by trying to name a fault in this 1922 recording from Massenet's Grisélidis by Louis Cazette. Maybe you could say that the top B-flat at the end of the middle section is a little pinched (but it'll do!). Or, if you follow the score, you could point out that its detailed dynamics are not always followed scrupulously. Why don't we hear more about Cazette? He was born in 1887, joined the army as a young man, and though he had already begun serious vocal study, quickly returned to uniform to serve in the First World War. So his debut was delayed to 1919. Then in 1922, during a performance of Don Giovanni at the Opéra-Comique, he was accidentally nicked by a colleague's rapier-point, contracted tetanus, and died within days. All we have to remember him by is a painfully short list of ten 78-rpm records. The point about those sometimes-ignored markings in the score, meanwhile, raises the question of whether it is a good idea for a composer to micro-manage the musicality of the interpreter. Cazette's singing is superbly nuanced and varied - but he's following his own expressive path to the details, not translating a diagram. Not counting slurs, Massenet provides 81 dynamics, verbal instructions, or articulation markings within three pages. In the entire third act of Tristan Wagner gives his tenor four crescendos, two dynamic signs, and two accent marks. Food for thought. Pol Plançon (1851-1914) was one of the top basses in the most lucrative cities on the international opera circuit - Paris, London, and New York - for about a quarter-century. He sang Verdi, Wagner, and the whole French repertory, and specialized in the Mephistos of Gounod, Boito, and Berlioz. His reputation, then and ever since (thanks to his late-career recordings), was for elegance above all. Practically any of the 68 individual items he recorded could sustain that reputation. One of his favorite showpieces was the Drum Major’s aria from Le caïd, an 1849 comedy by Ambroise Thomas that stayed in the Opéra-Comique’s repertory until 1911. Plançon often sang the aria on the Metropolitan’s Sunday concerts, and made five recordings of it. All five are fantastic, and the fifth, made in 1907, has been reissued many times. It has the best overall sound quality, but the singer, unsurprisingly for a deep bass at 56, was starting to require a cautious approach to top E. Here instead is the third version, made in 1903, in more primitive sound but with just a shade more élan in the final pages. Plançon really demonstrates just about every recognized way of getting from one note to another in the Bel Canto tradition. Slow portamento, smooth ordinary legato, firm marcato, articulation by slurred pairs, completely separated staccato notes, quick scales (ascending or descending), rising or falling arpeggios, rapid turns around a single note, a perfect trill - it’s all there, a textbook in four minutes, plus diction and character. OK, the music is a little lightweight, and we could wish he had chosen a Mozart concert aria or Assur’s mad scene from Semiramide instead….but still. For those curious about agility: the 16th-note runs near the end go at a tempo of MM=120, accelerating to about 132 as Plançon steps on the gas in the coda. Manuel García jr., writing in 1847, said that 132 was the required pace for a professional-level soprano (and that the most virtuosic singers could reach 152!). Plançon is one of the few basses on record to get all the way up to “soprano speed” - but he had plenty of competitors who could handle 120 with no problem. The charms of Martha have faded, but Flotow’s sentimental comedy was once a repertory staple worldwide. That meant, of course, that translations were prepared for every opera-loving country, and when starry Italians were about to sing it, Flotow made it his business to add some new arias. This is one of the latter, sung by the starriest Italian baritone of them all, Mattia Battistini (1856-1928). Battistini had some faults, especially in his later years (we can hear him only from the age of 46 to 68). But this disc, cut in 1906 when he was fifty, mainly shows his virtues, and they were the classic ones. Above all, sheer line: a tone that keeps spinning - no gaps, no falters, no fuzzy notes or lackluster ones. It’s not so much the details that make the effect here - it’s the absence of negative details, the cumulative impact of uninterrupted quality. It is a baritone of distinctly tenorish quality - perhaps startlingly so in the recitative, where there is no hint of the darkened vowel sounds that later became popular for lower male voices. Even in the context of Battistini’s time, this was definitely a voice happier at the top of the range than the bottom. But there is plenty of power in the area around middle C that is not quite high enough for most tenors to sound powerful. And once the aria proper starts, the magic begins: soft notes like velvet, loud ones like silver and seemingly effortless. And it just keeps coming, eventually with hypnotic effect through sheer continuity and generosity of tone. The burst of virtuosity in the final cadenza is an unexpected bonus. A copy of the music can be downloaded here, in case anyone would like to follow along or any lyric baritones would like a fresh audition aria. This week’s record is the only known sample of a voice from which we wish we had dozens. On 22 April 1905, a visit was made to the Paris studios of the Fonotipia company by Jean de Reszke, by far the most celebrated tenor in the world, who had just two years earlier retired from the stage, and Mme. de Reszke, née Marie de Goulaine, Comtesse de Mailly-Nesle by a previous marriage. The tenor recorded an aria each by Gounod and Massenet and ordered their immediate destruction upon hearing the test pressings. He also sat as piano accompanist for his wife in songs by Lalo and Gounod along with two excerpts from the latter’s Sapho. Her vibrato is narrow and rapid - faster than that of anyone singing today, though only on the high side of average for her time. It may take a little getting used to; a lot has changed, in both technique and taste, since the time of Romantic opera. But it is 100% consistent and regular. And the singer’s poise and concentration are remarkable for someone completely unused to recording. She creates a real atmosphere. Rosalia Chalia (1863-1948) sang with the Met, but not much - just two roles, Santuzza in 1899 and Aida in 1902. She never appeared in the great houses of Europe. Most of her stage life was spent on the lively American touring circuit - season after season across the United States and in Caracas, Mexico City, San Juan, and Havana, the city of her birth. For some reason (and we should be thankful) Chalia agreed to do something no comparably important soprano was doing at the time: she went into the recording studios and sang songs and arias by the dozens, first for Bettini in 1899, then for Victor and Zon-o-phone in 1900 and 1901. These are the most primitive of primitive recordings; only later did Calvé, Melba, Sembrich, Eames, Tetrazzini and the other divas of the day venture to immortalize their voices. It seems Chalia couldn’t compete with those ladies at the Met - but wow, she could sing! The aria from L’étoile du nord (or La stella del nord, as it is called on the label) is not something we would expect today from a Santuzza or an Aida: crystal clear runs, arpeggios, and chromatics at a virtuoso pace; effortless register shifts; echo effects with astonishing accuracy of intonation and attack. This was before the days of splicing or editing - you had to get it all right in one take, however many tries that took. It took Chalia exactly two tries to nail this one. A fantastic CD of Chalia’s recordings is available from marstonrecords.com. Teatro Nuovo puts great emphasis on learning from the singers who had never heard, or heard of, microphone singing - primitive recordings from more than a century ago, forming a link to the traditions of opera’s heyday and the infinite potential of the natural, unassisted human voice. Check this space regularly for samples! Teatro Nuovo puts great emphasis on learning from the singers who had never used, or heard anyone using, a microphone - primitive recordings from more than a century ago, forming a link to the traditions of opera’s heyday and the infinite potential of the natural, unassisted human voice. Check this space regularly for samples! Italian opera houses didn’t generally have a stand-up conductor until the 1860s or later. Even La traviata and Il trovatore were premiered without one! The leadership was shared between the first violinist, usually listed as Primo violino e capo d’orchestra or Violino principale e direttore dell’orchestra and a Maestro concertatore or Maestro al cembalo, who sat at a keyboard (whether he played it or not, and how much if so, depended on the style of the music and the needs of the ensemble). "Concertare" means putting things together; the maestro concertatore was the person who had rehearsed the singers - usually a composer, and if the opera was new, always the composer. The first violinist, meanwhile, was basically responsible for the orchestra, and the two of them shared the job of coordinating the vocal and instrumental elements in performance. Teatro Nuovo is reviving this style because we want an ensemble of players and singers listening and reacting to each other every exciting minute - and we want to put each singer in the driver’s seat for his or her aria. In a way, the stand-up conductor is an intrusion on this process. It became a necessary function later, when orchestration became much more complex. But if Rossini didn’t need it, why should we? The older concept emphasizes more leading and less directing. Leading is something you do from within a team, with your hands on the music like everyone else. Let’s see if our team can make it work! Legend has it that Rossini composed the aria in the time it took to cook a pot of rice, after the original Tancredi (Adelaide Malanotte) had objected that his first attempt to write her entrance aria was insufficient. For years it was called the aria del riso. It makes a better story than the true one: “Di tanti palpiti” was the first attempt - it was the one Malanotte didn’t like - and so a more ambitious aria, “Dolci d’amor parole,” with a spectacular violin obbligato and an offstage echoing voice, was cooked up to replace it. Both are delicious; Teatro Nuovo’s audiences can compare them when the second aria is featured in Tancredi rifatto. Another legend is impossible to verify. One of the catchiest lines is “Mi rivedrai; ti rivedrò” - “You will see me again, I will see you again.” According to endlessly repeated accounts, humming this bit of melody became a coded way to threaten a witness who was about to testify against a powerful criminal. It seems judges eventually had to ban even the wordless tune in court.